When refugees from the Middle East had first landed on Greece in the beginning of 2016, they were healthier than the locals. Now, more than 50,000 undocumented migrants are languishing in unsanitary refugee camps. They are exposed to oppressive heat and unmanageable health crises, with little or no access to health care. The Elliniko camp, located few miles from Athens, is spread out on old and abandoned airport buildings and dilapidated stadiums built for the 2004 Olympic Games. It houses over 3,000 migrants, mostly from Afghanistan and Syria. The white tents set up by the United Nations High Commissioner for Refugees on the old hockey and baseball fields within the stadiums offer little protection from sun. Few hundred kilometres north in Thessaloniki, a 26-year-old Syrian refugee from Damascus died at Softex migrant camp on July 25. That day, heat was oppressive. There are hundreds of tents exposed to the sun and it becomes difficult to stay inside the tents when temperature hovers over 40°C on some days. While temperatures inside the refuge tents are still tolerable, the heat in plastic bathrooms in Softex was far intense. More than heat, it is the fear of acquiring infectious diseases that is keeping displaced people awake at night. These makeshift shelters, made of blankets and sheets, are potential breeding grounds for epidemics. According to a doctor working with the Médecins du Monde (MdM), about three of every four residents in Elliniko suffer gastrointestinal infections. Scabies—a contagious disease caused by mites that burrow under the skin—is also being reported frequently. 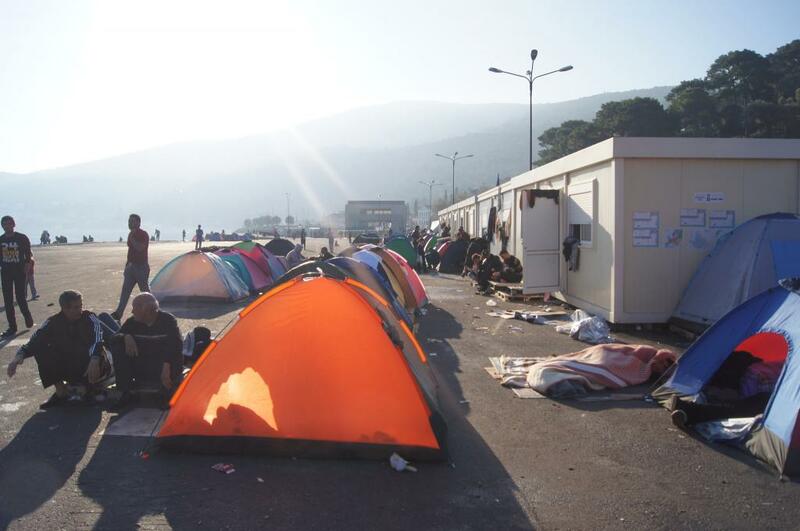 The Greek Centre for Disease Control, a government body, inspected 16 camps at the start of July. The authorities recommended that all the camps should be closed due to unsanitary conditions and lack of adequate water supply. While one-third of residential properties in Greece remain vacant, migrants are forced to live in abandoned commercial properties like warehouses and airport terminals. These spaces are not designed for long-term human habitation. The refugees are deprived of access to medical care, vaccinations and pre-natal services. Tens of thousands of these migrants now feel trapped in the EU country that is least equipped to provide care. Steep cuts in health care budget due to austerity measures have devastated Greek hospitals. They are beleaguered to the point that the country’s ability to detect the spread of disease has fizzled out. The NGOs and charitable organisations are also ill-equipped to treat refugees with more serious ailments. Those people need specialists. According to the terms of a $94-million EU emergency aid given to Greece to meet the needs of migrants, only a few NGOs are allowed to provide basic medical services out of tents and trucks within the camps. Children in these refugee camps are not spared the misery. Humanitarian organisations such as Doctors Without Borders (MSF) are finding it hard to provide sufficient vaccine to vulnerable children in refugee camps because of the its high cost. Pneumonia, which is the “single largest killer of children under five worldwide”, is generally acute in humanitarian crises. The aid workers are reportedly paying US $68 to vaccinate just a single child against pneumonia. The global price, however, is hardly $3 a dose. Apart from pneumonia, the humanitarian organisations are also focusing on polio, diphtheria and tetanus. Their effort to provide the hexavalent vaccination, which protects against six diseases, looks somewhat muted because they don’t have enough funds to cover all the children since each vaccine costs $70 per child. In recent months, aid workers in Greek asylum detention centre have been trying to convert Muslim detainees into Christianity. According to reports, people held at the Moria detention camp on Lesbos Island were given conversion forms inside copies of Arabic versions of the St John’s gospel. The instances of conversions among refugees made headlines in Germany in May when close to 80 Muslim refugees from Iran and Afghanistan converted to Christianity in Hamburg. Church leaders have claimed that some conversions are done under pressure by taking advantage of the migrants desperate to gain asylum and get a better life.